Looking to buy a reticulated gargoyle gecko for sale? 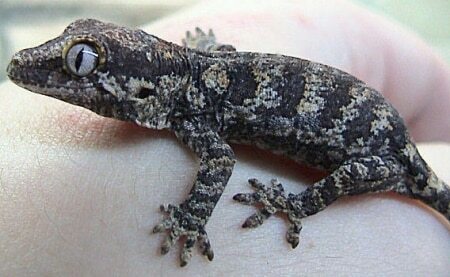 We have some of the nicest reticulated gargoyle geckos for sale online anywhere! The gargoyle gecko or New Caledonian bumpy gecko, Rhacodactylus auriculatus, is a species of gecko found only on the southern end of the island of New Caledonia. It’s habitat is threatened by deforestation on the island. We have some gorgeous juvenile gargoyle geckos for sale. Our captive bred juveniles are just about 8 months old and very easy to care for. Our gargoyle geckos are hand raised and as tame and sweet as they are beautiful. At GeckosGeckos.com, we have a biologist on site, and handle our geckos often in order to ensure a friendly, calm and relaxed pet, and only work with top genetics to ensure we are improving the captive bred species as part of our efforts to provide the best possible pet geckos for sale in the world. Shipping is via FedEx next day air, in heated or cooled insulated shipping boxes, with 1 shipping charge covering up to 4 geckos for sale. If you are searching for some of the nicest crested gecko for sale anywhere, be sure to check out our sister site, CBReptile.com… Captive bred reptiles for sale, our sister company also offers some fantastic geckos for sale including leopard gecko for sale, crested geckos for sale, gargoyle gecko for sale, african fat tailed gecko for sale, chameleon for sale and more.